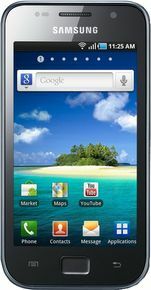 Samsung I9003 Galaxy SL is currently not available in any stores. Watch your favourite video songs and movies in video player. It supports MPEG4, H.263, H.264, DivX, XviD, WMV, AVI, 3GP, Flash Video file types. Listen to your favourite songs in music player. It supports MP3, AAC, AAC+, eAAC+, FLAC, WMA, WAV, AMR, OGG, MIDI etc. file types. The Samsung I9003 Galaxy S is a solid smartphone. Its slim, its got lots of screen estate and oomph under the hood. But it fails to bring anything new to the table and by dropping the gorgeous Super AMOLED screen it has lost the Galaxy S line most important selling point.